Hilton Head Island will be Live & Swingin’ this May as the Odyssey Jazz & Swing Orchestra performs tributes to legends such as Frank Sinatra and Tony Bennett. 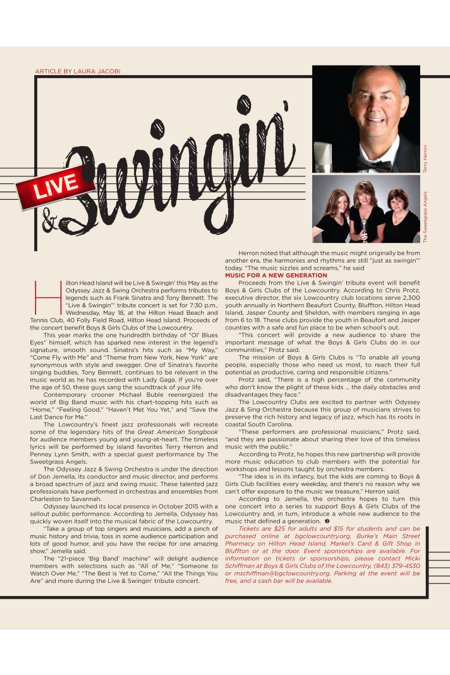 The “Live & Swingin’” tribute concert is set for 7:30 p.m., Wednesday, May 18, at the Hilton Head Beach and Tennis Club, 40 Folly Field Road, Hilton Head Island. Proceeds of the concert benefit Boys & Girls Clubs of the Lowcountry. This year marks the one hundredth birthday of “Ol’ Blues Eyes” himself, which has sparked new interest in the legend’s signature, smooth sound. Sinatra’s hits such as “My Way,” “Come Fly with Me” and “Theme from New York, New York” are synonymous with style and swagger. One of Sinatra’s favorite singing buddies, Tony Bennett, continues to be relevant in the music world as he has recorded with Lady Gaga. If you’re over the age of 50, these guys sang the soundtrack of your life. The Lowcountry’s finest jazz professionals will recreate some of the legendary hits of the Great American Songbook for audience members young and young-at-heart. The timeless lyrics will be performed by island favorites Terry Herron and Penney Lynn Smith, with a special guest performance by The Sweetgrass Angels. The Odyssey Jazz & Swing Orchestra is under the direction of Don Jemella, its conductor and music director, and performs a broad spectrum of jazz and swing music. These talented jazz professionals have performed in orchestras and ensembles from Charleston to Savannah. Odyssey launched its local presence in October 2015 with a sellout public performance. According to Jemella, Odyssey has quickly woven itself into the musical fabric of the Lowcountry. “Take a group of top singers and musicians, add a pinch of music history and trivia, toss in some audience participation and lots of good humor, and you have the recipe for one amazing show,” Jemella said. The “21-piece ‘Big Band’ machine” will delight audience members with selections such as “All of Me,” “Someone to Watch Over Me,” “The Best is Yet to Come,” “All the Things You Are” and more during the Live & Swingin’ tribute concert. Proceeds from the Live & Swingin’ tribute event will benefit Boys & Girls Clubs of the Lowcountry. According to Chris Protz, executive director, the six Lowcountry club locations serve 2,300 youth annually in Northern Beaufort County, Bluffton, Hilton Head Island, Jasper County and Sheldon, with members ranging in age from 6 to 18. These clubs provide the youth in Beaufort and Jasper counties with a safe and fun place to be when school’s out. “This concert will provide a new audience to share the important message of what the Boys & Girls Clubs do in our communities,” Protz said. The Lowcountry Clubs are excited to partner with Odyssey Jazz & Sing Orchestra because this group of musicians strives to preserve the rich history and legacy of jazz, which has its roots in coastal South Carolina. According to Protz, he hopes this new partnership will provide more music education to club members with the potential for workshops and lessons taught by orchestra members. “The idea is in its infancy, but the kids are coming to Boys & Girls Club facilities every weekday, and there’s no reason why we can’t offer exposure to the music we treasure,” Herron said. Tickets are $25 for adults and $15 for students and can be purchased online at bgclowcountry.org, Burke’s Main Street Pharmacy on Hilton Head Island, Markel’s Card & Gift Shop in Bluffton or at the door. Event sponsorships are available. For information on tickets or sponsorships, please contact Micki Schiffman at Boys & Girls Clubs of the Lowcountry, (843) 379-4530 or mschiffman@bgclowcountry.org. Parking at the event will be free, and a cash bar will be available.